When the already short Seattle days end at 4:18 pm (the earliest of the year! 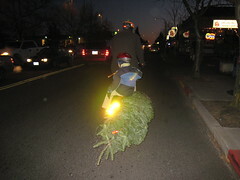 ), the window for an after-school tree-gathering-family-bike adventure is small. 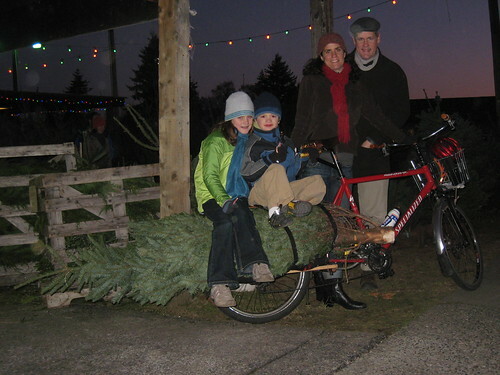 We tried to grab the kids right after school, bundle them up in extra (or is it Xtra) layers and hustle our way over to the local summer berry stand/temporary pumpkin patch/Christmas tree oasis while the feeble sun still shone. Though we did our best to make our selection in the waning light and hightail it home before everyone turned into a Popsicle, it wasn’t meant to be. Not to point fingers, but damn, those kids are picky. I think we liked it better when they didn’t get to vote. 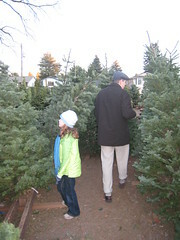 Instead, we shivered up a storm while we picked up, fondled, and rated what seemed like every Noble Fir on the block. I finally stepped in with fatherly veto power to break a three-way tie (no surprise to anyone who knows me: The winner was $11 cheaper) and get us on our way with a minimum of bloodshed. 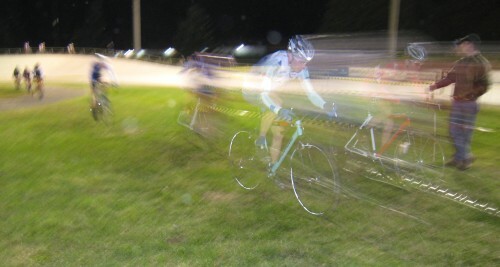 Then it was on the bike for a should-be-quick trip home in the dark. And Did I mention it was cold? Hell yes. We even resorted to ducking into a Starbucks for cocoa and cider so the kids’ little piggies could thaw out before the final leg home. Said Fir now sits in a bucket, hydrating in preparation for its month on stage in the lights. And me? I’m already over the voting scandal and looking forward to the fourth anniversary adventure. Tim and I blather on and on about bikes and our adventures on the blog and we love to hear from people who find some of the info useful. Sept. 23, 2007: I should have posted this when it happened, but gosh I felt soooo ashamed! And then we drove… on World Car Free Day of all days!